Pacific women's soccer's Alexis Vilarino '21 shows off the book that she read to students as part of the annual Stockton Rotary Read-In. More than 60 members of the Pacific community, including faculty, staff, students, student-athletes and alumni took part in the "Stockton Rotary Read-In" on Thursday, Feb. 21, an annual literacy event where community volunteers read to children in kindergarten through third grade in Stockton-area elementary schools. Pacific provided volunteer readers in six Stockton schools. "I am so proud that Pacific has been an integral part of the Read-In since its inception, a testimony to the university's commitment to advance the cause of literacy in our community," said Jim Dugoni '86, senior director of development at University of the Pacific and chair of this year's Rotary Read-In. 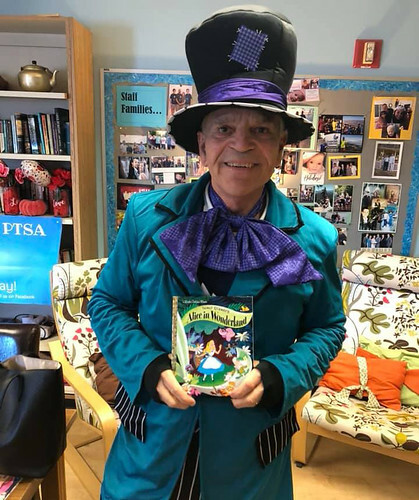 "I have been touched by the wonderful feedback from the school districts, principals and teachers about the importance of having volunteers come to their classrooms to model reading out loud to young elementary school students." About 20 student-athletes, coaches and other athletic department staff, including Director of Athletics Janet Lucas read to students at Woodrow Wilson Elementary School, Don Riggio School and Marshall Elementary School, while other Pacific community members read to children at Victory, San Joaquin and Pulliam elementary schools. Pacific joined forces with hundreds of volunteers and multiple organizations including mayor Michael Tubbs, the Stockton Police Department, the Stockton Kings, United Way and others for the citywide initiative. "Participating in the Stockton Rotary Read-In and seeing the wonder and joy in those young people's faces was an absolute gift," Lucas said. "Early childhood literacy is so important for student success, and it helps them understand that they can achieve their dreams. I am delighted that Pacific Athletics was part of this special community program again." This was the 15th year Pacific Athletics has participated in the program. This is the 28th year the Stockton Rotary Clubs have put together the annual Read-In. A total of 850 volunteers read to more than 20,000 students at 68 schools throughout Stockton and the surrounding areas and contributed over 1,000 new books to the schools for their libraries. In addition, event partners Barnes and Noble offered volunteer readers a discount on books purchased for the Read-In and donated those bookfair proceeds to the Stockton-San Joaquin County Public Library. The Rotary Read-In began in 1991 as a humble day that included just the Stockton Unified School District and has grown to encompass the majority of the schools in the Stockton area in 2019 with dozens of organizations and hundreds of volunteers. Advancing early childhood literacy is a key component of University of the Pacific's Beyond Our Gates "Reading by Third" initiative. Here are just a few of the volunteers who made this day a success!